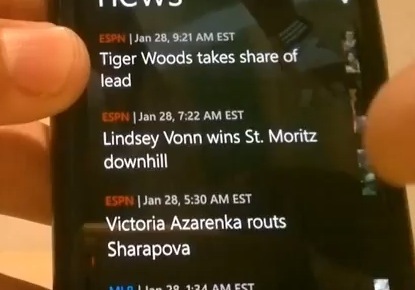 Another Nokia/Lumia exclusive app for WP, today we take a look at ESPN for WP (on the market place you can find ESPN ScoreCenter and ESPN news, but ‘ESPN’ can only be found on your Lumia Phone under ‘Nokia Collections’); which is why there is no real “developers blurb” and the link below is dead (that’s the link you get when you share the app with someone else through the marketplace on your phone). The ESPN app brings you the latest sports news be it NBA, NFL, Soccer, NHL, NCAA, Rugby, Cricket, Formula 1 and much more; each sport category includes the latest scores, game highlights, Upcoming and previous games, and direct links to the websites of all teams. ESPN also has a ‘Social’ section which brings you the latest updates from ESPNs official Twitter & FB, as well as ESPN exclusiv interviews and insights. Honestly this app has more than enough information jam-packed into it to keep any sports fan happy, short of live game feeds you couldn’t ask for anything else. « Nokia Lumia 800 sold out in Finland?